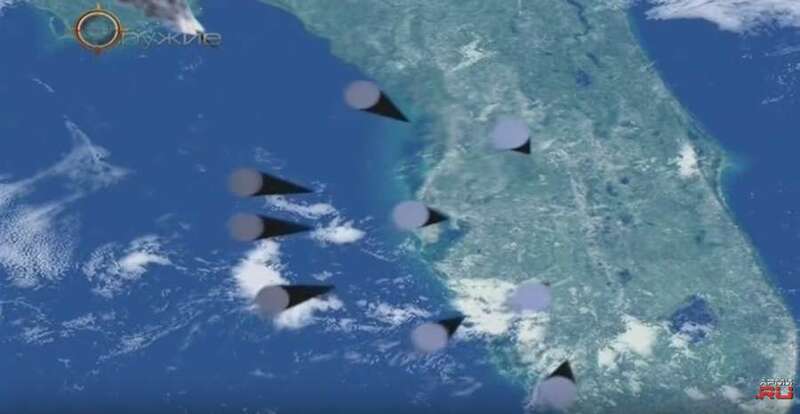 Missile simulation clearly shows the Sunshine State getting attacked. WASHINGTON – Remember that Russian simulation showing missiles raining down on Florida? Despite a very clear view of Florida, where President Donald Trump spends a good deal of time, Russian President Vladimir Putin today denied it was even Florida. "There was not a caption saying Florida. They could — take a more careful look at it. There was never a caption, 'Florida,' " Putin told Chris Wallace of Fox News. "No, but you can see it on the map," Wallace replied. "It was flying over the eastern coast of — no, no, no, it couldn't be seen on the map," Putin said. "Just take a closer look, and don't try to scare your population with make-believe threats. And now — I'm pretty sure I can give you as a present this footage." Last year, Defense Secretary Mattis said that Russia is the greatest threat — Russia is the greatest threat to the United States and, he has since made it clear, an even greater threat than terrorism. In March, you introduced a new generation of Russian missiles, including what you called an invincible missile you said — that could evade — defeat all of our missile defenses. And you even released a video that showed this super missile flying over the United States and hitting Florida very near where President Trump's estate is at Mar-A-Lago. Aren't you escalating the arms race, and aren't you being deliberately provocative? It — that was not signed Florida. There was not a caption saying Florida. They could — take a more careful look at it. There was never a caption, "Florida." No, but you can see it on the map. It was flying over the eastern coast of — no, no, no, it couldn't be seen on the map. Just take a closer look, and don't try to scare your population with make-believe threats. And now — I'm pretty sure I can give you as a present this footage. And now to the offensive weapons. They were not born out of nowhere. They were born as a response to the unilateral withdrawal of the United States from the ABM treaty. From the very beginning, we've been warning our American counterparts that we are not going to join the global anti-missile system. We see no purpose for it. But we'll do everything to make means to overcome it. Well, the response of our counterparts was that the United States designed this anti-missile defense system, because it's not against — it's not designed to be guided against you. In 2003 or 2004, I think I mentioned one of those systems, and there was no response from our American counterparts. So, what we did now — we just demonstrated that we do have means to overcome this system. It's just a negotiating item. I do hope that, in terms of strategic stability, we will be able to find a mutually acceptable solution for both sides, and that applies to the INF treaty and the intermediate and shorter-range missiles as well.